Since its inception, Joelson Industries has earned a well-deserved reputation as an innovator in lifestyle products. Our design team constantly strives to originate items that define taste and create the perfect ambience. 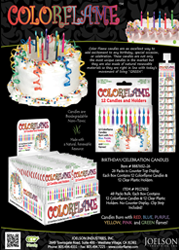 Colorflame products are open flame items that feature brightly colored fire when lit. 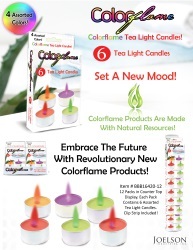 Instead of a dim, flickering yellow, Colorflame products blaze with dazzlingly bright hues of RED, BLUE, PURPLE, YELLOW, PINK and GREEN! Joelson Industries Colorflame products are designed to enhance the mood and ambience for special occasions that cannot be duplicated by conventional lighting means. Each one of our products creates extraordinary experiences that render them unforgettable! Our current products incorporate revolutionary technology and cutting edge design elements that redefine industry conventions. Joelson Industries will continue to create items that defy expectation – appealing, exciting lifestyle products that enhance all occasions, big or small. Become a member of our family and contact us about wholesaling, jobbing, or distributing Colorflame products! Over the past 25+ years, we’ve built a unique business model that can service all of your organization’s needs, whether you’re a small, growing business that requires a drop ship program or a member of the Fortune 500. Since 1988, the world’s leading retailers have trusted Joelson Industries to provide them with an array of quality and exclusive programs with top notch service to make our customer’s job easier. Our dedicated Account Teams bring you new and unique products more quickly than you ever thought possible along with the service & accuracy you can expect from an industry leader. 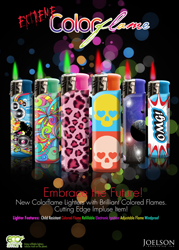 Colorflame products are open flame items that feature brightly colored fire when lit.